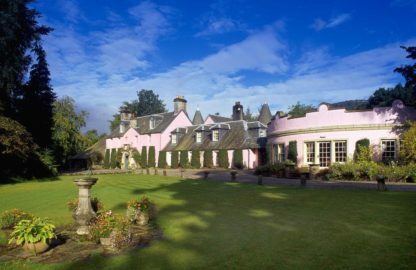 Set in secluded 20-acre grounds, the Roman Camp Country House Hotel is set on the banks of River Teith in scenic Callander Village. It offers luxurious rooms, private fishing pools and an award-winning restaurant, 15 miles from Stirling. Dating back to 1625, the building is filled with original period features. Individually designed en suite rooms include an LCD satellite TV, tea and coffee making facilities, bathrobes and a hairdryer. Some rooms also feature spa baths and lounges areas. The Roman Camp serves a full cooked breakfast daily. The restaurant has been awarded 3 AA Rosettes and serves modern cuisine featuring locally sourced shellfish and meat. Lunch and dinner are served in the charming dining rooms with scenic garden views. Guests can enjoy afternoon tea in the oak-panelled library and drawing room and the property also has a secret chapel. Free fishing is available in the 2 private pools and the Loch Lomond and Trossachs National Park is ideal for walking, golf and sailing. Glasgow and Edinburgh are around 1 hours drive away.